I needed a little lift in spirits this week. I have the flu. And NYFW is going on right now without me. But I am having a ball watching live streams of the show, which is something I couldn’t be doing if I was at work, so …. I guess it all works out in a way, right? This ruffle sleeve sweater from Shein is so fun maybe I’ll get it in another color too. They have pink and red, perfect for Valentine’s Day! Jeans – Old Navy (really old) – they don’t make this style anymore, I found these (though the Rock Stars are very stretchy/clingy) and these are cute too. Susan of The Midlife Fashionista is my fav look from last week’s linky. Isn’t this animal print poncho the coolest?! And hey, don’t forget to get on the Fashion Should Be Fun mailing list! ahhhh…what a bummer you’re sick, Dawn!! I hope you get well soon! I was just thinking about trying to DIY some sleeves like this—they are so fun!! Oh, the flu… I’ve been having that for a week, finally starting to feel myself… get well soon! I will join you for sure! When is it? Are you sending email reminders! I’m in! Oh, no! The flu is the worst. Seeing you in these sleeves is certainly fun, though. I recently wore a dress from Shein with the same sleeves and loved it. So funny, when I first pulled it out I thought of shaking maracas, too! Feel better soon, sweet lady. Awww you’re the sweetest! OXOX! So sorry you have the flu! I hope you’ll be better real soon! That top is super cute! I love the entire outfit! Agreed! Those sleeves have to put you in a good mood! You are looking amazing in this outfit Dawn Lucy!! Love those fun sleeves! Hope you feel better soon! Happy Friday! Sorry to hear you are sick and missing NYFW 🙁 And besides it’s snowing in New York. But you look fabulous in that top! The ruffle detail is so much. Have a great weekend! What a fun sweater! The ruffle sleeves are gorgeous! Thanks for hosting and have a great weekend! Aww thanks so much, Katie! Get better soon! Love this sweater and it’s cool sleeves. Thanks so much for the link up! I hope you feel better soon…I hate to be sick. Thanks for the link up and take care of yourself! I’m obsessed with this look! I love the sleeves on that fabulous top! I hope you are feeling better soon! Love this look. I have the flu too! It’s awful! Nothing quite as UN-glamorous as the flu, right?! I am loving that fabulous statement top! Hope you feel better soon! 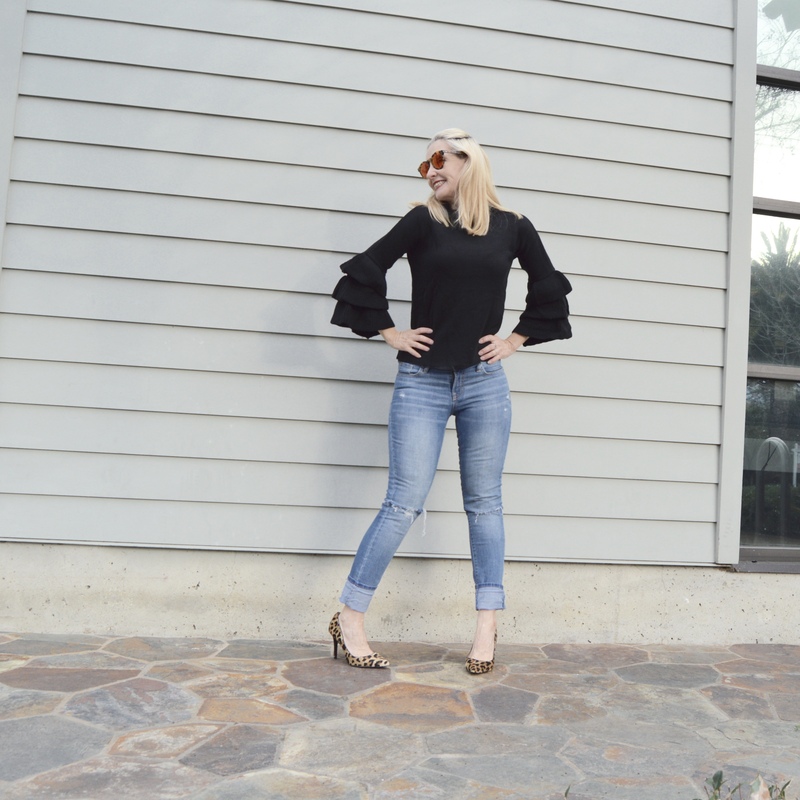 I am such a huge fan of flutter, bell, ruffles – so I give my 2 thumbs up for this top!!!! I love this sweater on you Dawn! Fab sleeves and the jeans look great with it! Hope you feel better soon. No fun in being sick! Make some tea and rest! Obsessed with this too and this trend right now. Love how you didn’t make a fuss with it, it’s styled simply with jeans and flats (leopards a neutral right?! Lol). Perfect weekend look, very editor on a casual Friday chic. Hope you feel better soon, friend. I love big sleeves, oversized sleeves, bell sleeves and such. If I can describe that black top in a few names, the title of your blog suits it perfectly. This is such a Dawn Lucy outfit and I mean it as a compliment! I am loving the sleeves! Such a great outfit! Oh lady…..the flu bug has been going around here too! I hope you are better. You sure look precious in this top! Yuck the flu. Hope you feel better really soon! That top is really cute and I love the ruffles so much! Love this casual look. Your sleeve detail and pop of leopard are perfect!